Wowza, that was a fast weekend! Unfortunately, we didn’t get a whole lot done in the garage, but I did start planning our next project. Or projects, actually! So stay tuned for a new room makeover, and progress on a stalled-out project soon! 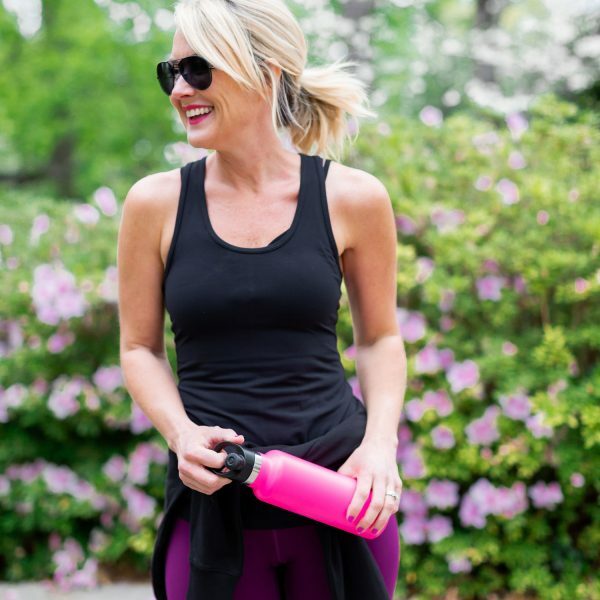 I also loved reading your comments and advice on Friday’s Girl Power post! It’s so encouraging to know we aren’t alone in this huge responsibility, and I so appreciated your kind words! Today’s post is basically a brain dump of what’s been rambling through my head lately, so hang with me through the random! ONE // I always hate sharing fun finds with you, only to have them sell out. 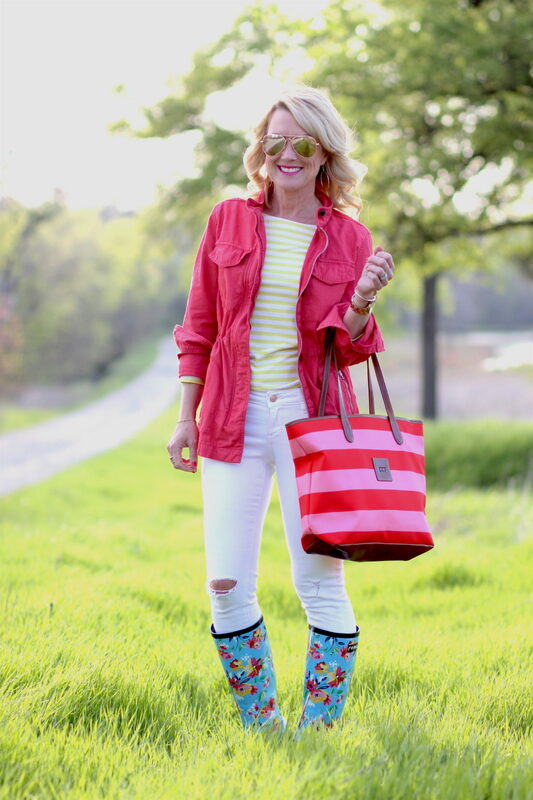 But I’m happy to report several of my favorite pieces of late are now back in stock…including several closet staples from last year…starting with this pink utility jacket! I loved it so much I styled it three ways, but the options are pretty unlimited. It comes in several colors if pink is too flashy for you, and runs a little oversized. I’m wearing an XS. 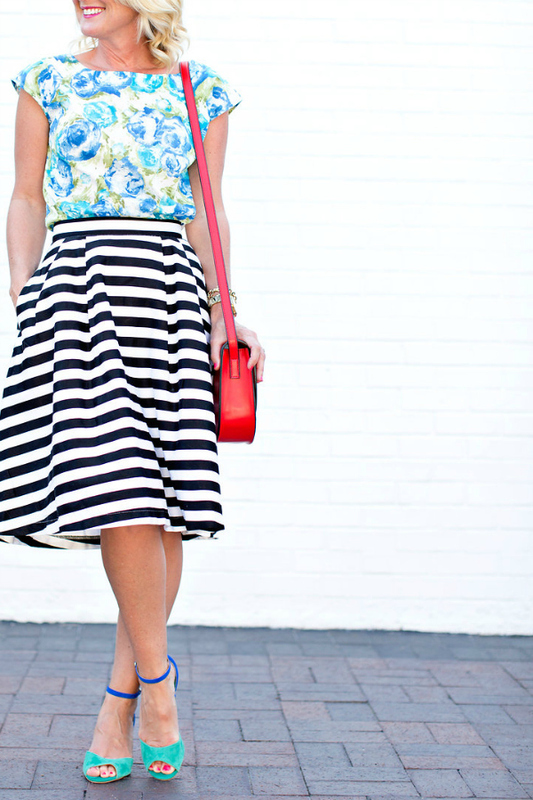 This outfit is several years old, but still just as stylish…and the dress is back in several great colors. I’d recommend sizing up unless you’re looking for a body-con fit. 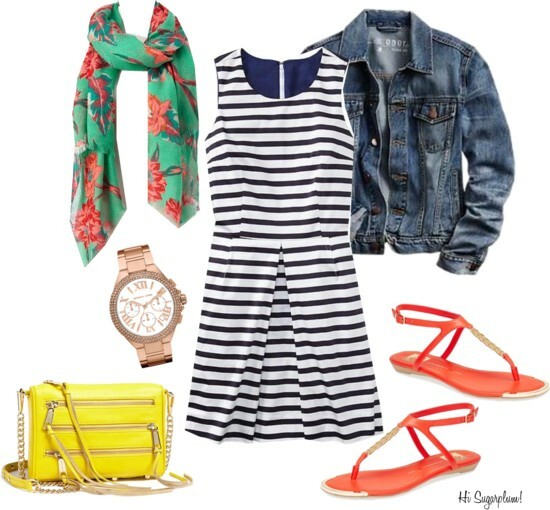 It easily dresses up or down with the just the swap of shoes. 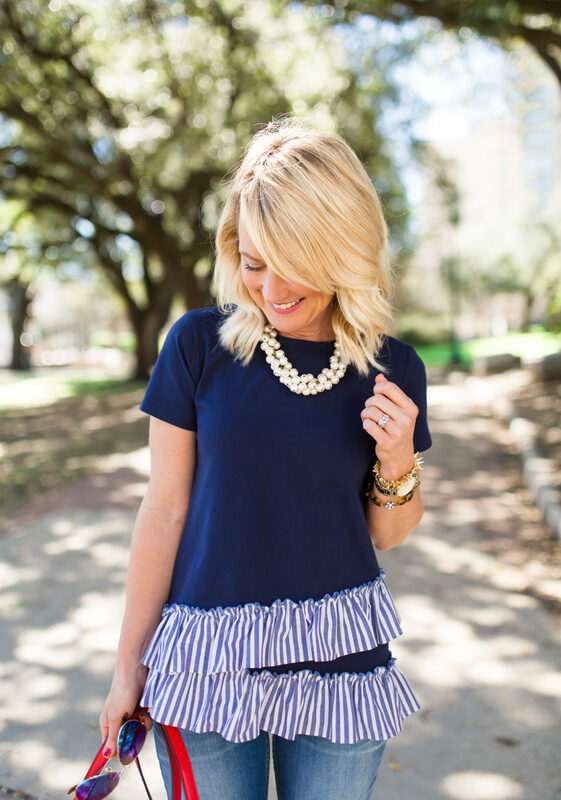 This ruffled top is one of my favorite finds so far this season, and it’s back in several great solids. I did size up for a bit more length and room through the shoulders. 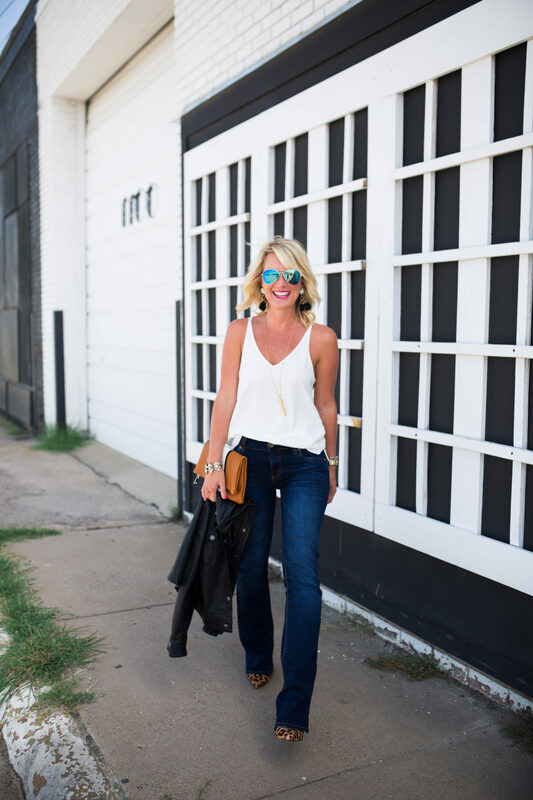 Remember these bootcut jeans, that magically add inches to your legs (see them styled here & here)? Now they’re available in a new, lighter rinse, perfect for Spring and Summer months. (I even found these for curvier shapes.) They do run big, so size down. Also, stick with the regular sizing unless you’re under 5’2″. From the response of this recent Date Night Style post, many of you are looking for special occasion dresses for Summer events…this lace dress is available in seven colors and under $100! The styling options with a good striped skirt are virtually unlimited, and I just discovered this new one…in the perfect knee-length, with cute ribbon waistband. I tried the regular size in store, and it was a tad long, so I’ve got the petite ordered. I’ll be sure to include in a future Dressing Room Diaries! TWO // I love clutches and cross body bags, but when it comes to everyday, I always reach for a sturdy tote…and Barrington makes the cutest ones around! 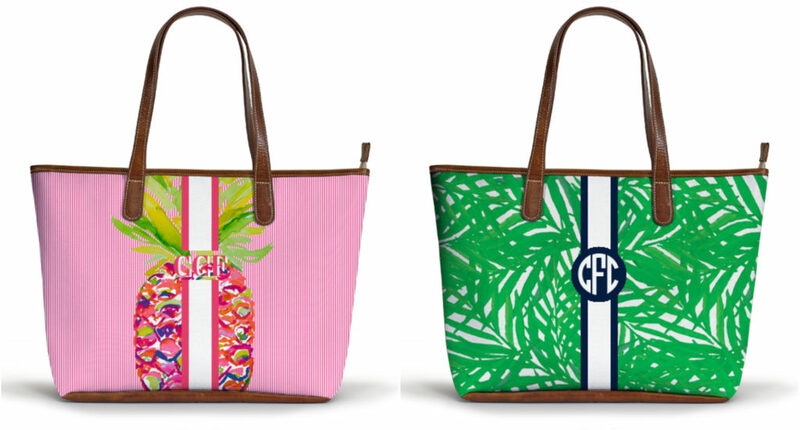 They just released their new Summer Monogram Collection, and I swear I spent hours playing with all the customizable combinations!!! It’s addicting, and each is cuter than the last. I think I’ve narrowed my faves down to these. Which is your favorite? (Pssst, they make perfect Mother’s Day gifts, too! Just ask Mama Sugarplum!) 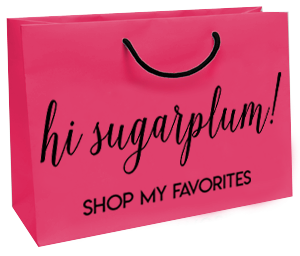 Use SUGARPLUM10 for 10% off your total order! THREE // We’ve had a string of really warm days here, which means one thing for sure….it’s sandal season! I don’t know if I’m more excited by the shoes, or the process of getting my feet ready to be seen! 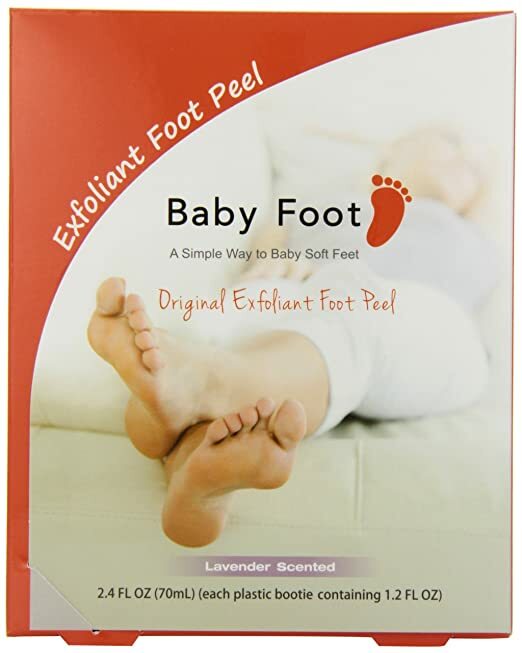 This Baby Foot product is amazing, and horrifying, all at the same time. Read my review and experience with the magic product here. I’ve already ordered mine for this year…have you?! FOUR // If you follow me on Instagram or Facebook, then you’re likely familiar with Like to Know It…or you’ve at least seen it, but maybe been baffled about how it works. 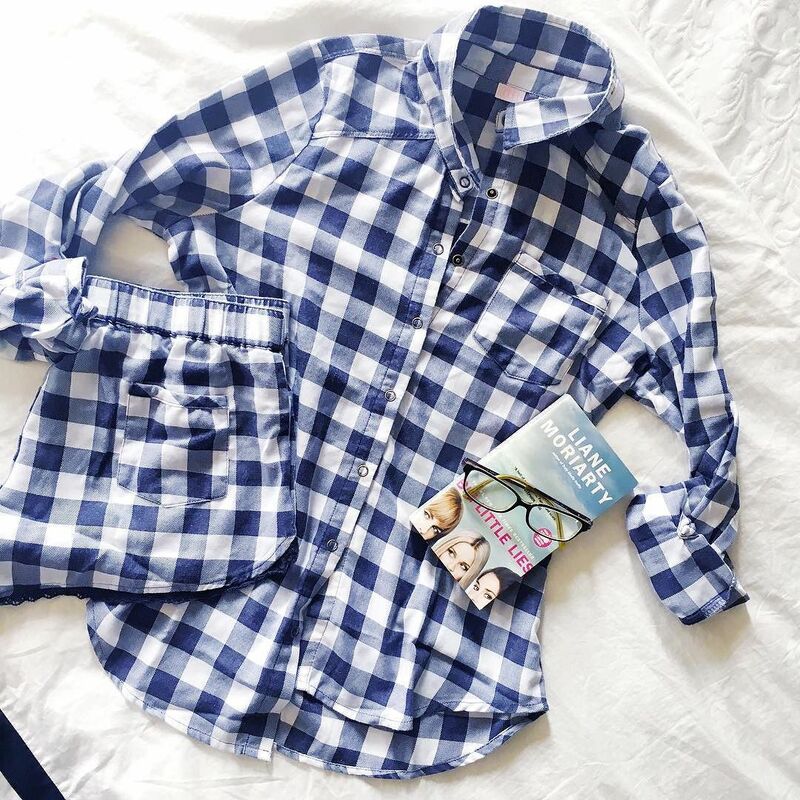 Well now, there’s an even easier way to shop my everyday #SugarplumStyle posts, and it doesn’t involve a bunch of emails, or sign-ups. I actually have no idea how they’ve created this technology, I just know it’s genius. All you have to do is download this free app (available at the App Store), and then anytime you see an image with the little Like to Know It heart in the corner (on Instagram, Instagram Stories, Facebook, or even Pinterest), just take a screen shot, and links will immediately appear in your app! It keeps all your favorites saved and accessible in a single spot…so it’s great for not only shopping, but creating an inspiration board! Here’s a nifty graphic that breaks it down more. FIVE // I’m so excited to be an auntie again!!! Remember my darling sister who married in this gorgeous mountain wedding a few Summers ago? She just had her first baby, and I’m obsessed with his precious face. I can hardly wait to smell his little baby head, and love on all of them!! Hopefully we can get to Montana soon to see them! SIX // Mr. SP and I attended a fundraiser event last month, to support some friends, and a local special needs school, Chase’s Place (I wore this dress!). They had paired local artists with each of the students to create one-of-a-kind art…and all the pieces were stunning!! I was immediately drawn to this colorful one, and couldn’t believe we were able to snag it! 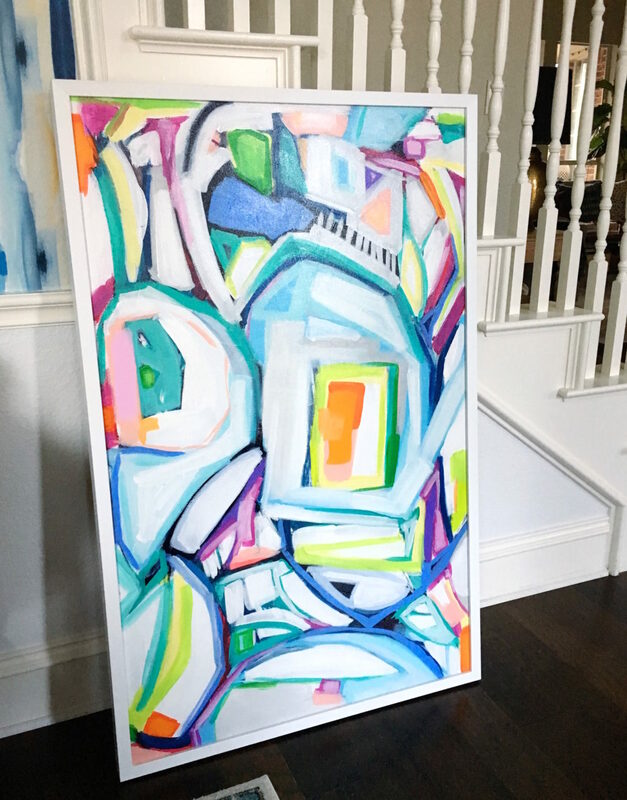 We found out after the auction, that the artist is the uber-talented Kristen Dowd of Gypsy Soul Interiors, whose pieces I’d just fallen for in the West Elm catalog…and happens to be a blog reader!! #smallworld And the girl she painted it with, happens to be the daughter of someone I went to college with!! #smallerworld I’m honored to have this piece, and it reminds me daily of the power of people coming together to do good for others, as well as, fills me with extreme gratitude for my healthy children. SEVEN // My friend Eden at Sugar & Charm is one of the most talented people I know, especially when it comes to food and entertaining! So when she tells me she’s got the world’s best chocolate chip cookie recipe, I’m going to accept it as fact! I’m warning you though, her site is endless eye candy, so be prepared to spend some time drooling and being inspired! 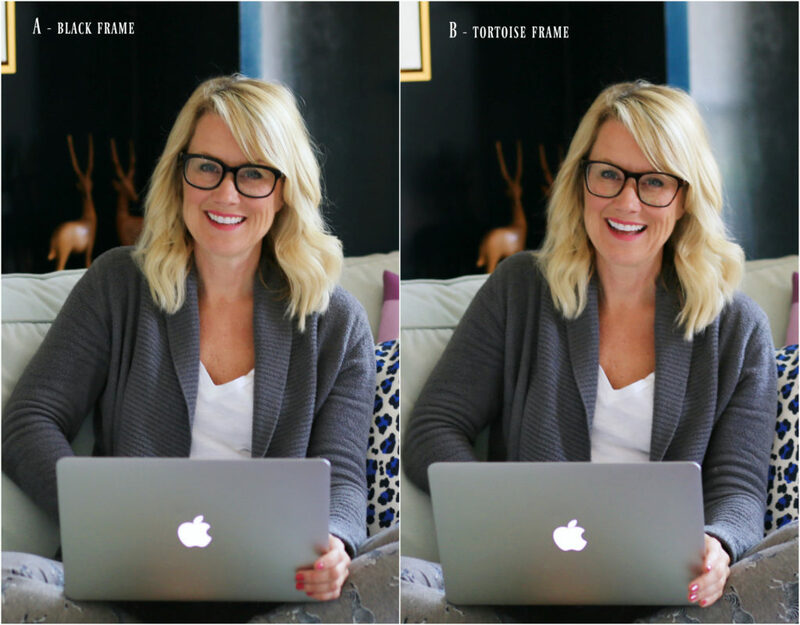 NINE // I told you about this online eyeglass company in my last Faves Under $50 post, and my new glasses arrived! The whole process was incredibly easy…I just saw my local eye doctor for an exam, then entered the prescription information on their site. They have so many stylish options, and the prices are unbelievable! I think I’m going to order some prescription sunglasses next. They were running a special, so I actually picked up two different pairs…but I can’t decide which ones I like best. Or if I picked good frames for my face. What do you think? TEN // Finally, several items I’ve featured lately are now on super-sale, starting with my go-to utility jacket (size down one!). This darling, and super-soft pajama set, is 40% off! Several pattern options available…also, I sized up for a looser fit in the shorts. 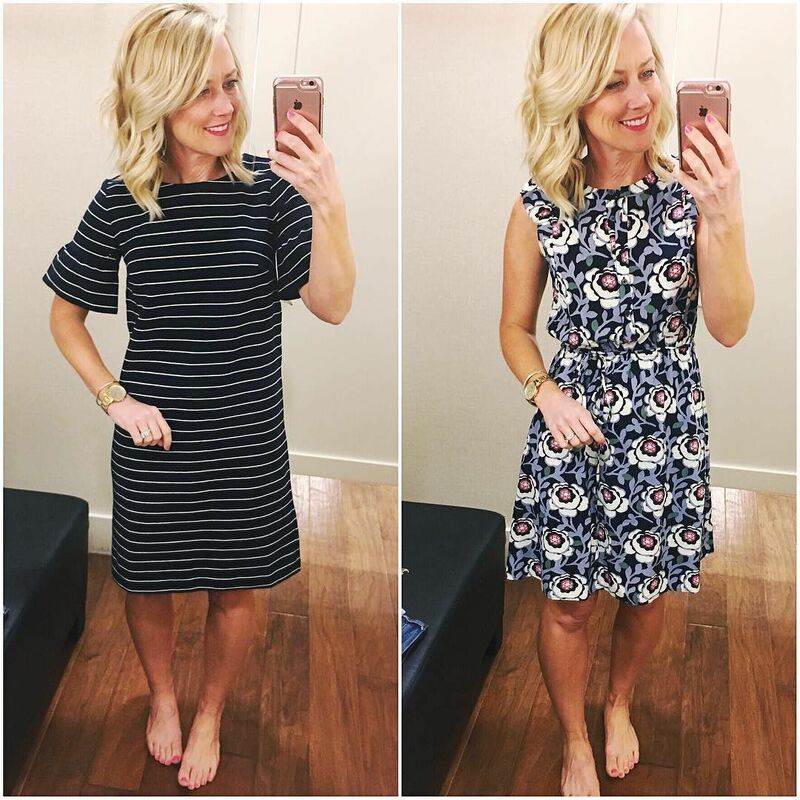 Both these dresses are up to 40% off now, too. 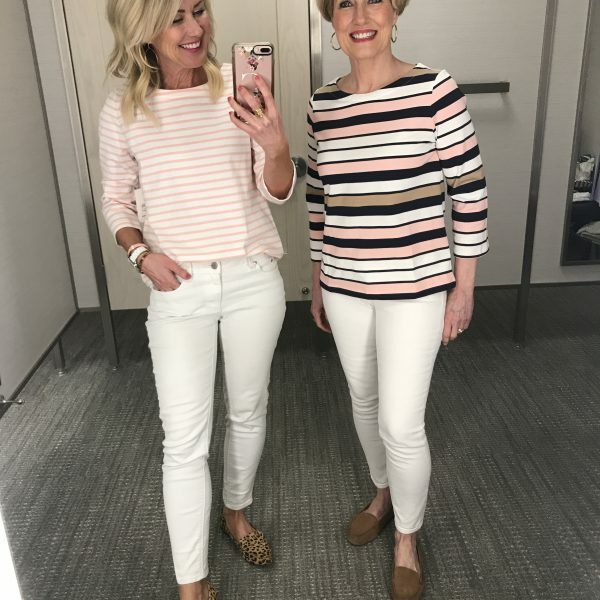 I’m wearing an XS in both, but ordered an XS petite in the striped cutie for a shorter length. This flirty off-the-shoulder top is also 40% off…and so are the flats! Love the green toned military and utility jackets. I need to get one myself! Just bought a green utility from Gap after seeing you in yours so much. Love it! I’m not a fan of double denim so a jacket I can throw on in spring and summer with jeans is great. I don’t love those glasses on you. You’re petite and those frames look much too big for you. I’m also finding the dark frames very hard against your pale face and hair. I’d recommend a narrower frame and I’d love to see a colour like purple on you, or a lighter tortoiseshell or even turquoise. I like the aviator sunglasses on you, especially the blue lenses but when the frames are the only dark thing, like for normal glasses, it breaks your face up too much. KUT from the Kloth jeans have become such a favorite splurge of mine. The bootcut jeans are amazing and feel so comfortable! I love that pink utility jacket on you, but the Gap website is calling the color spring coral. Is that the same color you are wearing? Thanks Kim and Cassie, I was going to ask the same question. The jacket color looks so much prettier in your photo Cassie! So many cute outfits- I can barely remember what I loved best by the time I get to the comments section! 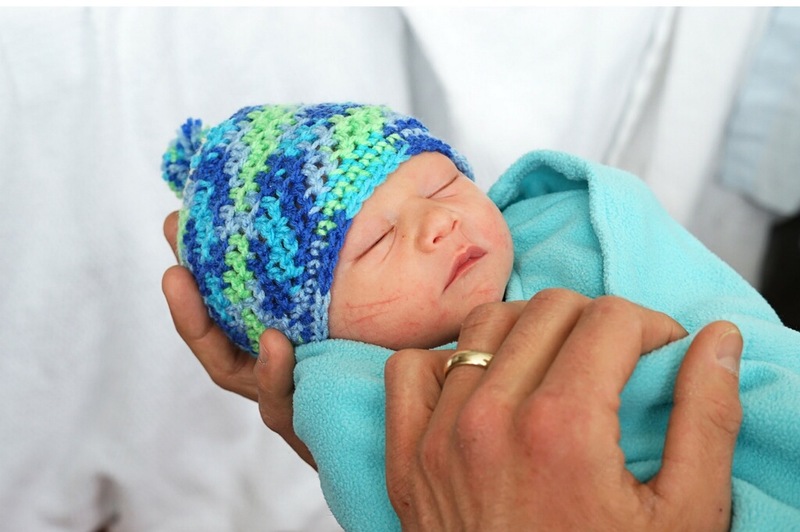 Congrats on your adorable nephew- he looks so precious! Thanks also for reminding me that I should make chocolate chip cookies soon… like maybe today. 😉 Have a great week, Cassie! Oh my goodness – that are piece is absolutely gorgeous! Can’t wait to see how you incorporate it into a room!!! 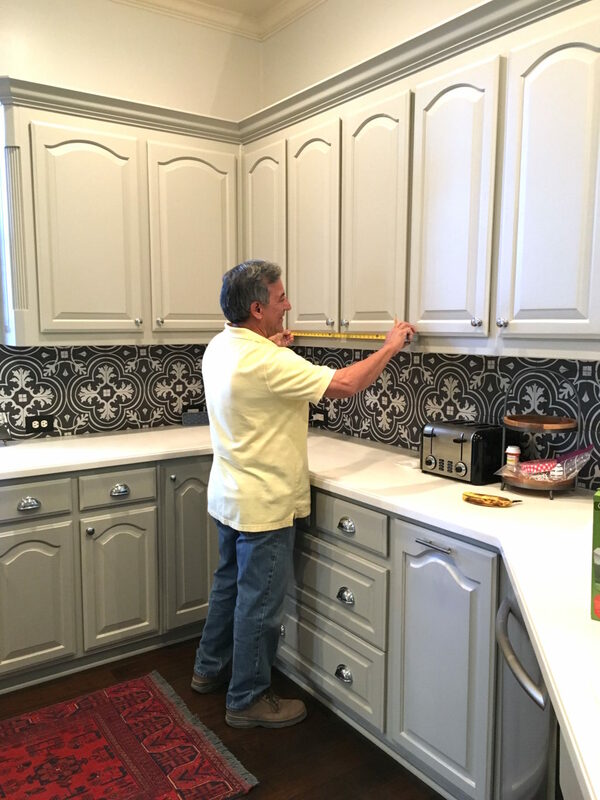 Would love to have your contractor info. We are in Allen and looking at options for a kitchen make over. Thanks! No problem! Shoot me an email at [email protected] ! Speaking of random ramblings..I made your Tuscan Vegetable Soup this weekend that you posted a couple of months ago – SO yummy! And about the easiest thing ever. Thanks for sharing! I agree with another commenter, I think a visually lighter frame would work better with your petite face shape and light coloring! Of course you could pull off a fun color too! Okay, guess I might be in the minority here but I totally love the dark frame on you as I like the contrast against your fair skin and blond hair. Recently found your blog and am enjoying following along. Oh my goodness, I love you!!! Thanks SO much for sharing and for the SWEETEST WORDS EVER!!! I am counting down the days to be with you all again!! You’re the sweetest Cass!! !